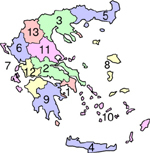 Following the second round of local elections yesterday, the ruling PASOK party won the majority of regional governorships (8 to 5). In municipal elections and -despite a high abstention rate- there was a change of leadership in the three major cities. In Athens, Giorgos Kaminis, the former Ombudsman, won the mayorship, with the support of Pasok, after defeating the incumbent New Democracy (ND) mayor, Nikitas Kaklamanis. In Thessaloniki, Greece’s second largest city, the independent Yiannis Boutaris, supported by Pasok, defeated ND-backed candidate Costas Gioulekas, while in Pireus, Vassilis Michaloliakos, supported by ND defeated Pasok candidate Yiannis Michas.